No movie review this week, but to make up for it, a review of the non-movie thing I did. My parents took me to see the Nutcracker! It was weird, there was no popcorn in the lobby and only a few desis and no trailers. What is this live theater MADNESS???? Do you know what I really really love in my entertainment? Words. And also, plot. Neither of which are available in The Nutcracker. I can handle my classical dance performances, my Mom is a dance fiend so she has been taking me my whole life to everything from Alvin Ailey to Baryshnikov. I like the little short ones with the kind of impressionistic plots, and lots of big fun leaps. Not so much the looooooooooooong ones with the classical plots and lots of “let us all stop here and watch two minor characters do a pas de deux for the next ten minutes”. The Nutcracker is essentially ALL minor characters doing long dances. And no plot at all. She has a fight with her little brother, and goes to sleep. That’s it!!!! That’s the whole thing!!!! Nothing actually HAPPENS. It’s the worst version of “it was all a dream”, because not only is it all a dream and therefore meaningless, it’s a really long and detailed dream and we have to watch Every Single Second. Sure, it’s pretty, but does it move the narrative along? I have seen The Nutcracker before, 30 years ago when I was 3. I vividly remember 3 things: 1. the creepy moment when all the little kids pop out from under the lady’s skirt; 2. Being fairly bored and sleepy; 3. The elevators in the theater had this little cage door that had to close before the real door could close and my Poppie showed me how it worked and I was FASCINATED. This production was at the Auditorium theater in Chicago which is so old it has no elevators at all, so that was a loss. But then the whole cage door thing is less exciting for me now because we had it in two of the apartment buildings I lived in. And the Auditorium does have lots of other cool features (old fashioned electric lights, big murals, a floor that is on a constant odd slant, the condemned upper balcony section that looms above you threatening to fall at any moment, that’s all cool). On the other hand, it was a really good production. They flipped the story and set it in Chicago during the 1893 World’s Fair, our heroine is the daughter of a poor sculptress Widow, they have a Christmas party and the Impresario who is organizing the fair surprises them by coming and seems to have a bit of a romance with the Widow while the heroine flirts a little with his apprentice. Heroine gets the Nutcracker, goes to sleep, has insane fever dream. Only the insane dream is set in the World’s Fair Pavilions with the Ferris wheel in the background and stuff, so that’s cool. And it includes dreaming that she dances with the apprentice/Nutcracker and her mother dances with the Impresario. And then the next morning, the Impresario comes to their little house again and surprises them at Christmas breakfast and it looks like maybe he and the mother will get together. Even with it being set in Chicago, and having some vague glimmers of that thing we call “plot” (thanks to the implication that her dream visions of her mother and the Impresario will carry over to the real world), I still got quite a bit sleepy and distracted by about midway. There’s just so much dancing!!!! SO MUCH!!! And hardly any edits or jumpcuts or camera movement to make it exciting. And no dialogue at all. I miss WORDS. This was also, now that I think of it, a bit of my reaction the first time. Which is why a few years later I feel in love with an old battered English language translation of the original story. 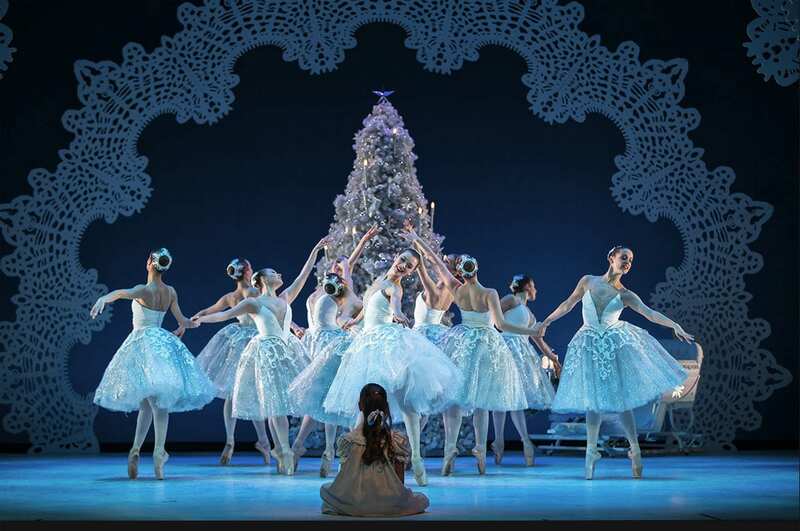 The Nutcracker was originally a beloved novel from Germany. It had a beginning and a middle and an end and all that cool stuff. And then 60 years later, the Russians got it and threw out all the plot and added in a lot more dancing instead (I think this might also be reason I can’t get into Soviet Cinema. Maybe instead of all the montages they could investigate this thing called PLOT?). I read the English translation over and over again obsessively until, well, now. It has everything! It’s wonderful! It is the dance fantasy I want! In the original, our heroine (named “Marie” not “Clara”, no idea why the Russians changed it) is surprised by the arrival of her weird uncle on Christmas Eve. He gives her the Nutcracker, she loves it, her little brother breaks it but she ties up the jaw with her handkerchief. That night, she sees a horrible rat army attack the living room and fights them off with her shoe and the help of the toys who have all come to life. The Nutcracker comes to life and thanks her. Then there’s this whole strange period where she gives away all her Christmas candy to the rat king as ransom so he won’t hurt the Nutcracker. Finally she gives the Nutcracker a toy sword and he fights and defeats the Rat King, and they celebrate in the Doll Kingdom (there’s also a whole backstory for how the Nutcracker changed from a smart young man to a Nutcracker). She wakes up to find the Nutcracker gone and no one believes her story. She waits and waits, and years later her weird Uncle shows up again with his “nephew” and she recognizes the nephew as her Nutcracker. He explains that with her help he was able to break his Nutcracker Curse and now he has returned to marry her and be with her always. Now, wouldn’t that be a better ballet???? Why just pick out the “Fight with brother Franz” and “And then she visits the Doll Kingdom” part of the story? At least include her using her shoe to fight off the rats or something! And the epilogue with him returning years later to marry her! Give us SOME kind of resolution! Also, dialogue. I can’t say that enough, ballet would really be improved if there was some nice wordplay in there, some fun back and forth in between dances. And camera work. Instead of just the whole stage all the time, let’s have some dynamism, tracking and zooming and stuff. Also, edits! Just edit together the whole dance so it is ALL big fun leapy moments, instead of LEAP and then blah. What I am saying is, all ballets should just be Indian movies instead. Picture The Nutcracker if this was the whole second act, just the leapy fun parts edited together. With lots of big light explosions and stupid lyrics you could sing along. Better, right? Well, you’re wrong. Ballet is great. You just require a certain mature sophistication to fully appreciate it. Now, if that was just expanded by about a thousand words, then we would have something! I’ve tried to see Nutcracker 10 times in my life, and all 10 times i slept through it. For such an expensive nap, might as well go to my local airport and nap in one of the airlines lounges. Looking at all the little kids around me, I almost started to think that might be on purpose. It’s a great little kid ballet, very easy to understand “plot” and all of that. Maybe it was designed so you could watch the opening, fall asleep, and wake up just in time to go home. Like you would if you were 3 years old and out late for the first time.